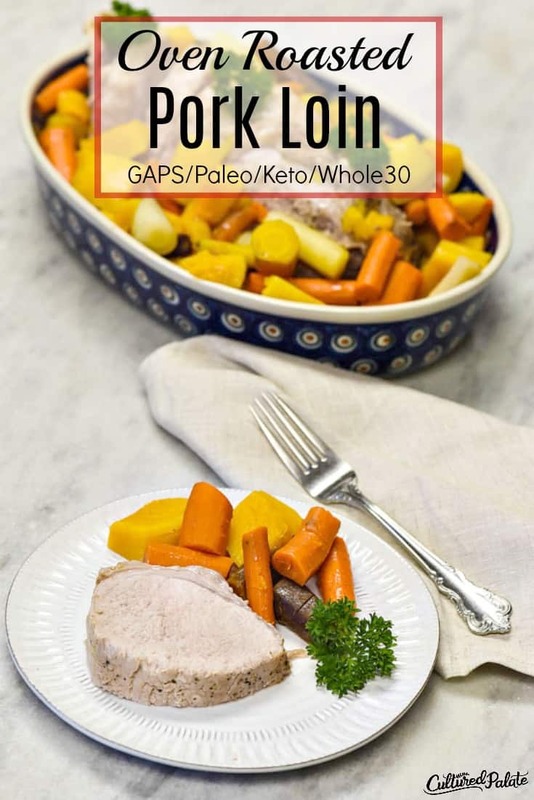 If you are looking for an easy pork loin recipe, I have it – Oven Roasted Pork Loin is about as easy as it gets. Adding vegetables to the pot and roasting at the same time, makes it a one dish meal that is deeeelish! 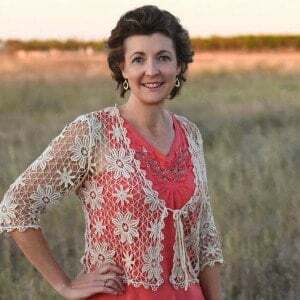 Plus, it is GAPS, paleo, keto, whole 30 and just plain nourishing! Oven roasting a pork loin is super easy and the results are a juicy delicious meal. I normally buy meat (other than what we raise ourselves) when it is on sale. It really helps the budget! Just like stocking up and freezing avocados when they are on sale, I stock up on meat and freeze it too. Did you know that pork loin comes from the rib cage of a pig? That’s right, it is the tissue along the top of the rib cage from the shoulders to the legs. It is thick enough to slice into steaks. Loin is popular in the United Kingdom where it is made into bacon and called “back bacon”. Americans call this type of bacon “Canadian Bacon” because it was brought to Canada by British settlers. How is Pork Loin Different from Tenderloin? Pork loin and tenderloin are cut from two different areas and not only look different, they must be cooked differently. Pork Loin is thick enough to be cut into steaks and is usually a long cut of meat. Sometimes it is tied with string before cooking. It is a great cut of meat to serve for crowds. The pork tenderloin is a long, thin cut of meat that is a muscle underneath the backbone of the pig. 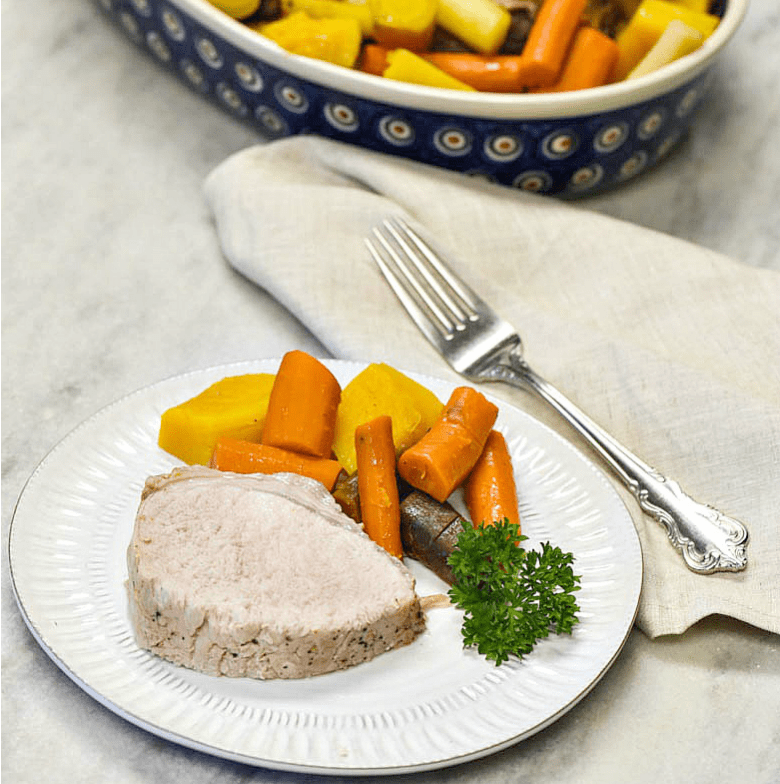 It does not need a long cooking time as does the pork loin roast. 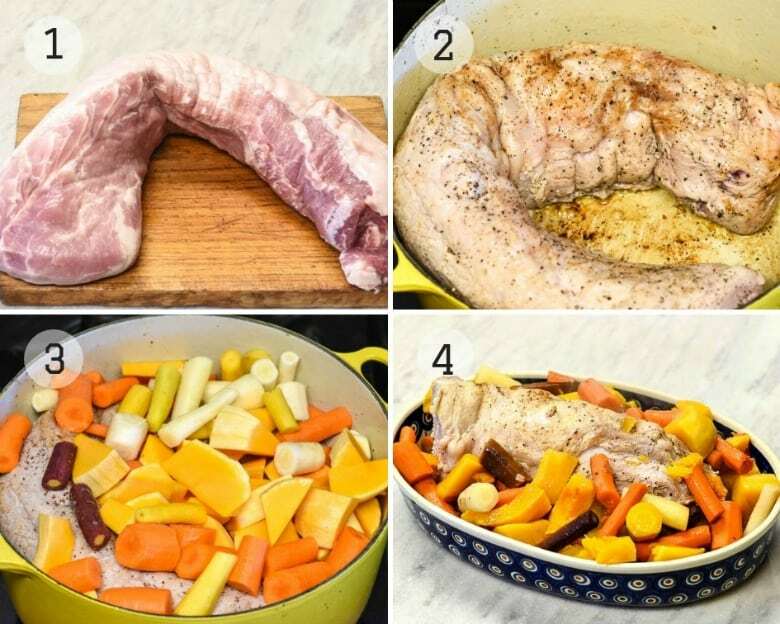 A pork loin keeps safely in the refrigerator for up to 5 days. If I do not plan to cook it within a few days, I freeze it. It is recommended to freeze pork for up to six months. Confession: I have kept mine longer than that without any problems. To thaw: Pork loin will take anywhere from 16 – 24 hours to thaw in the refrigerator before cooking. How Do I know When the Pork Loin is Done? The National Pork Board recommends cooking pork chops, roasts, and tenderloin to an internal temperature between 145° F (medium rare) and 160° F (medium). Since large cuts increase approximately 10° F while resting, for medium cooked pork, remove them from the heat at 150° F and allow a 10 minute rest before serving. What Size Pork Loin Should I Buy? The rule of thumb is to allow 1/2 pound (225g) of meat per person. Therefore, a family of 4 would use a 2 lb roast. However, remember that it also depends on the size of the people. My farm boys have BIG appetites and eat more than a smaller child. 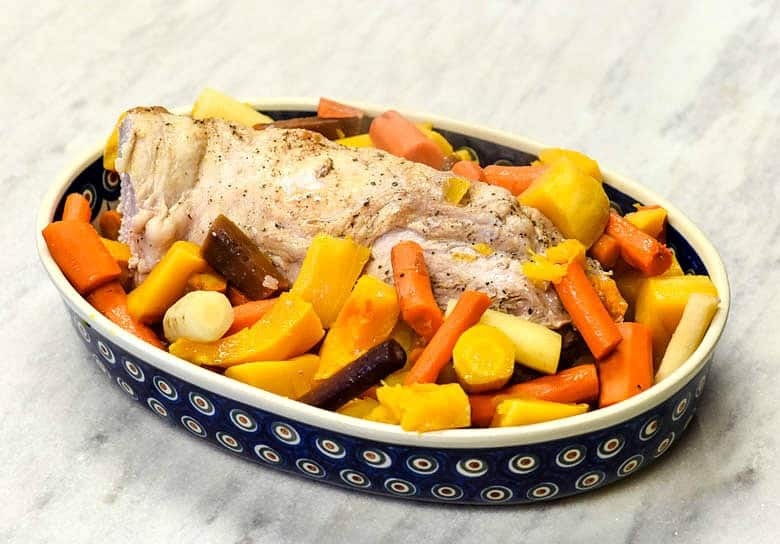 Plus, this recipe for roasted pork loin in the oven makes great leftovers! To cook the pork loin, I used a 3 gallon, cast iron dutch oven. It is large enough to hold not only the pork loin but also plenty of chopped onions, carrots and other veggies. While it is not necessary to have a pot that large, it is nice to have the vegetables cooking at the same time as the roast. Adjust the amount of vegetables to fit the size pot you have. The roast can also be cooked without the vegetables. Wine can be substituted for the water. Don’t Have a Dutch Oven? No problem, use what you have and be sure to use the lid or cover your pot with foil and roast as directed. But I seriously recommend you get one – I use mine so often! I have an enamel coated cast iron that holds and distributes heat perfectly. Because of our large family, I have a 9 qt round and a 6 3/4 qt oval. Both are Le Creuset and I have used them for years and they still look brand new! Searing a roast before cooking helps seal in the juices and enhances the flavors of the meat. It really helps keep your roast juicy. It also caramelizes the sugars and proteins in the meat and gives a nice brown crust and color to the roast. Heat a bit of oil in your pot on the stove – you want to see ripples in it indicating that it is hot. If the oil is not hot when you put the meat in, it will stick and tear as you turn it. Once the meat begins to brown, turn it over. Continue on all sides – for pork loin, I do all sides and the hold the roast up to sear the ends. The meat browns quickly and only takes a 2 – 3 mins on all sides so watch it carefully. Because the pork loin is round, I hold it in place, propped with spoons, in the pan as it sears. While the veggies are completely optional, they are delicious. And, it is a one dish meal when you load the pot with veggies and let them cook at the same time. When adding vegetables, be sure to cut them in large chunks. I’m talking bigger than bite size because they cook for so long, you don’t want them to become mushy. Since taste and diet needs (GAPS, paleo, keto, whole 30) vary, the following are suggestions that work well and taste great. Sprinkle the pork loin with the seasoning mix. I find it easier to rub the spices into the roast. Add 1 1/2 cups water to the pork loin in the dutch oven. Instant Pot Pork Stew – quick and easy since it is made in the Instant Pot! Chinese Sweet and Sour Pork – A delicious Chinese recipe. Prune Ketchup – An old fashioned condiment that is great with pork. 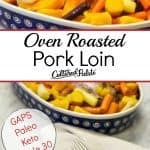 If you’ve tried this Oven Roasted Pork Loin Recipe or any other recipe on Cultured Palate please take a minute to rate the recipe and leave a comment letting me know how you liked it. I love hearing from you! You can also FOLLOW ME on PINTEREST, FACEBOOK, INSTAGRAM, YouTube and TWITTER. A fantastic way to serve pork that is tender and moist. Adding veggies while it cooks makes it a one dish wonder. Heat 4 tbsp olive oil in the cast iron dutch oven on the stove top. Add the roast and sear on all sides. Cover the roast with the vegetables. Put the lid on and cook at 350F for about 1 1/2 hours or until the center is no longer pink and juices run clear. To cook the pork loin, I used a 3 gallon, cast iron dutch oven. It is large enough to hold not only the pork loin but also plenty of chopped onions and carrots. While it is not necessary to have a pot that large, it is nice to have the vegetables cooking the same time as the roast. Adjust the amount of vegetables to fit the size pot you have. Wine may be substituted for the water. What are your favorite vegetables to add? Leave a comment! Sometimes I’ll just throw a pork loin into the crockpot with a jar of salsa and put it on low. By the end of the day you’ll have the perfect meat for pork carnitas – SO SIMPLE! Thanks for sharing on GAPS Friendly Fridays! This looks really simple and good. Unfortunately, there is a small change that needs to be mentioned to make it GAPS legal. On GAPS we don’t heat olive oil, because of its low smoke point. Other fat options (ghee, any animal fat, coconut oil) would work beautifully in this recipe, though! Would you be willing to make a little note of that? Yum!! This would be a great post to share at our Meal Plan Monday link-up at http://www.modernalternativekitchen.com! Hope to see you there tomorrow! This is a great recipe for the Pork Loin, we would just love it. Hope you have a great week and thank you so much for sharing with Full Plate Thursday. Love all the spices in this, looks delicious!